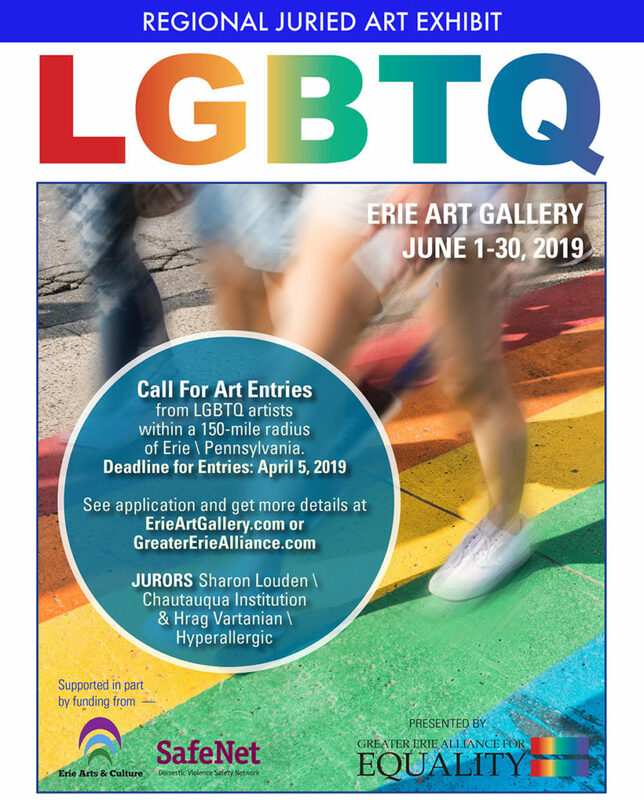 The Greater Erie Alliance for Equality (GEAE) is pleased to present a juried art exhibit of works by LGBTQ artists during Pride month, June 1-30, 2019, at the Erie Art Gallery. The exhibit will feature the works of LGBTQ artists who are 18+ years of age. We are excited that it will showcase not only the work of local LGBTQ artists but also that of LGBTQ artists from Cleveland, Buffalo, Pittsburgh and areas between. This exhibit will be a first for the Erie region. GEAE is proud to sponsor the exhibit and grateful to Erie Arts & Culture and SafeNet for their support. Your email is your application and how you submit your work for jurors. IMAGE LABELING: Image should be labeled as Title_FirstName_LastName_Medium_Size.jpeg. If the submission fee is not completed you will be contacted to complete or be rejected. Images of your artwork may be used in all media by Erie Art Gallery and the Greater Erie Alliance for Equality for purposes of publicity and reviews. All rights remain with the artists.